Yesterday we visited the church of Santi Apostoli. This is the church where candidates for the priesthood would go on Ember Friday to pray for guidance from the Holy Apostles. Today’s station church is Saint Peter’s Basilica, the place they came to be ordained on the following evening. We’ll visit this massive basilica again in a few weeks, so today let’s concentrate on the Old Saint Peter’s. Saint Peter was crucified around the year AD 67 in Nero’s Circus which was located just beside the Vaticanum hill. He was buried in a nearby cemetery. Pope Cletus erected a small chapel over the site of his burial and for more than two hundred years, Christians would quietly come here to venerate the first bishop of Rome. When Christianity was legalized in 313, Constantine commissioned a basilica to be built over the tomb of Saint Peter. Construction began around the year 323. Constantine himself is said to have carried out the first twelve mounds of soil on his shoulders, one for each of the twelve apostles. 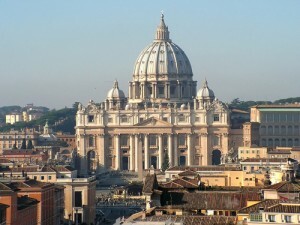 The first Saint Peter’s was consecrated in 326, but not completed until 349. Stairs led up to the early church which the faithful would ascend on their knees. An atrium was located just beyond the top of the stairs and a fountain in the shape of a pine cone was the center piece. The pine cone is still around. It’s now located in the courtyard of the Vatican Museums. Five main doors led into the basilica. Wooden beams supported the roof. Five aisles stretched down the center of the church. Near the end of the central nave was a triumphant arch with a mosaic depicting Constantine donating the basilica. Just beyond this was a mosaic of Christ with Saints Peter and Paul. Frescos, mosaics and statues decorated the basilica. And of course everything was lit up by oil lamps and candle light. Several popes, including Pope Saint Leo the Great and Pope Saint Gregory the Great, made significant improvements to the basilica by decorating the façade, the naves and even raising the sanctuary. Gregory the Great raised the sanctuary to make it easier for pilgrims to access the tomb of Saint Peter. With his design, people could walk down into the confessio using one staircase, and exit using another. Over the next twelve centuries pilgrims from all over came to visit Saint Peter’s Basilica. Hospitium, guest houses, popped up all around the basilica as everyone wanted to sleep near Peter’s tomb. Tourism was booming. The basilica even became the spot for a final resting place as popes, emperors and kings, all wanted to be buried near the apostle. Then, in 1309, the papacy moved to Avignon, France. The church was all but abandoned. The wooden beams rotted, doors were left open, animals freely roamed inside. For nearly 100 years the church was neglected. When the papacy returned to Rome in 1377, the pope took up residency at the Vatican. After several attempts at restoration, the decision was made to rebuild.